To avoid suffering – simply let go! We all resist and grieve when things__or people or opportunities__get taken away from us. Actually, what has to happen will happen – so why cling on to what’s being taken away from you and create so much suffering for yourself in the bargain? I read the moving story of journalist-turned-editor-turned-millionaire-turned-pauper-turned-destitute Sunita Naik, 65, last week. A former editor of the Marathi magazine Grihalaxmi, Naik had at one time, just over a decade ago, two apartments in prime locations in Mumbai, cars, a good, steady income and a solid cash reserve. She is single and does not have anyone in the world. Then, over the years, she lost her job, got into debt, had to sell off her apartments, and live off the interest her cash reserve was generating each month. However, someone known to her, under the pretext of helping her with her banking work swiped her accounts clean, leaving Naik penniless. Evicted from her rented house in Thane, Naik came to the streets. 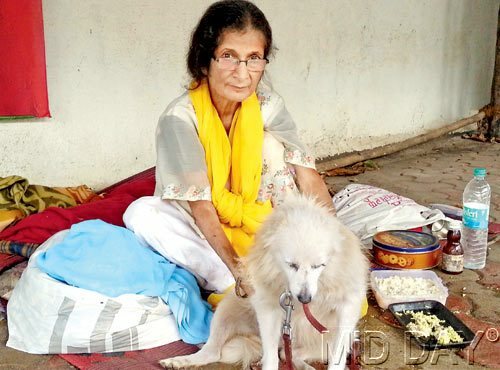 She took refuge on the pavement outside a gurudwara in Versova and lived there for a few months with her pet dog, Sashi. A Mid-Day reporter bumped into her one day and ran her story in the paper. People pitied with her. But few showed active interest in helping her. She was not begging. She was just homeless and penniless. Finally, a compassionate couple, Christine and Gregory Misquitta offered her shelter in their home. They love dogs so Sashi found a home too! This story, of course, reminds us yet again of the fickle and fragile nature of Life. But I also learned from Sunita’s story that she displayed a great sense of “let-go”. She seemed to be in great acceptance of the whatever was happening to her Life – whether it was a career-high at one time or numbing penury and homelessness at another! And things did happen to her – just the way they had to, right up to good folks, the Misquittas, taking her home! A prime cause of suffering in our lives is that we resist whatever we dislike. But whatever’s happening to you does not pause to enquire whether you like it or not. It just happens. So, when you can’t prevent whatever’s happening, the best way forward is to stop wanting to and trying to control it. Simply let go. And let things happen! Irrespective of what you believe or think, whatever happens, eventually happens for your good __ every single time! On this Gokulashtami, Sri Krishna’s birthday, revisiting the Essence of the Bhagavad Gita, can, I believe, have a calming, uplifting effect on you – no matter what you are dealing with currently! Whatever happened, it happened well. Whatever is happening, it is happening well. Whatever will happen, it will also happen well. What of yours did you lose? Why or for what are you crying? What did you bring with you, for you to lose it? This change is the Law of the Universe. Author AVIS ViswanathanPosted on August 28, 2013 March 14, 2016 Categories Bhagavad Gita, Christine Misquitta, Gita Saram, Gokulashtami, Gregory Misquitta, Grihalaxmi, http://schemas.google.com/blogger/2008/kind#post, India Today, Inner Peace, Intelligent Living, Krishna, Sunita NaikLeave a comment on To avoid suffering – simply let go!